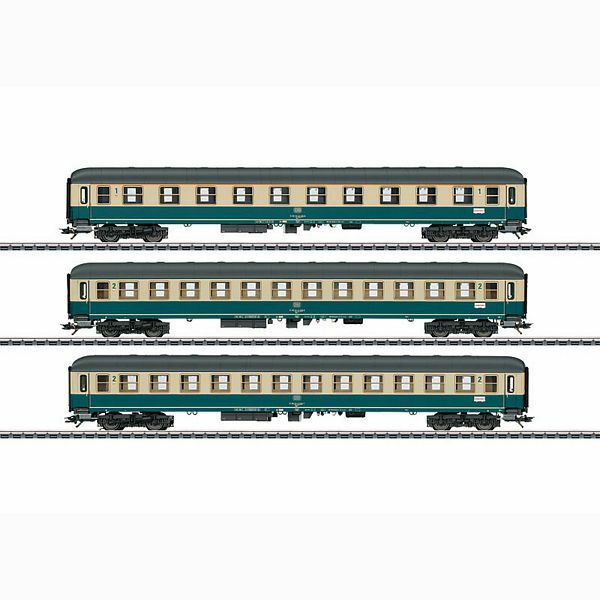 Prototype: One type Am 203.0 compartment car and two type Bm 234 compartment cars painted and lettered for the German Federal Railroad (DB) on a special run. The cars look as they did in the summer of 1985. Model: The entry doors have one-piece door windows. The entries have folding steps. The cars have Minden-Deutz design heavy trucks with double brake shoes and a separately applied generator. All of the cars have factory-installed LED interior lighting and operating current-conducting couplers. Maintenance-free warm white LEDs are used for the lighting. A pickup shoe is mounted on one car. The 73407 marker light kit can be installed on all of the cars. One type Bm car has built-in marker lights. Total length over the buffers approximately 84.8 cm / 33-3/8". The entertainment car with sound to go with this set can be found under item number 43868.